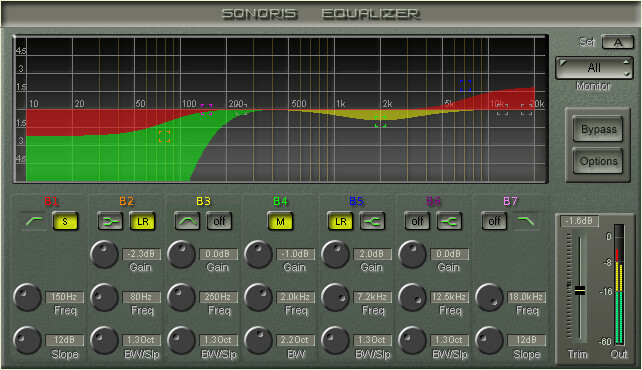 The Sonoris Leveler is a freeware compressor suitable for mastering or mixing in SAWStudio. In the development of the Leveler, a well known vintage leveling amplifier was held as starting point. 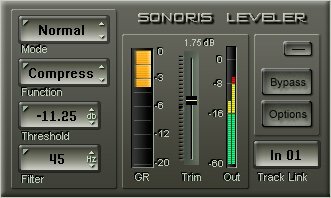 The Sonoris Leveler has a high resolution gain reduction meter. The ratio is fixed but can be set to “compression” or “limiting”. Attack and release are fully program dependent and the envelope is dual stage. The output section of the plugin also features a limiter. This guarantees that the output will never exceed the 0dB point. This limiter can also be used as an effect to “warm” up a signal. 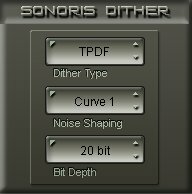 The Sonoris Leveler is able to process one channel only. With this feature, in combination with the Sonoris MS Codec, it is possible to perform very powerful processing in the MS domain. Dual stage opto envelope for both attack and release.